As war rages between the stars, brave diplomats of the Alliance to Restore the Republic seek support from far-flung worlds, strike bargains to secure resources, and struggle to keep the Rebellion fighting one more day. Set out on your own diplomatic missions in Desperate Allies. 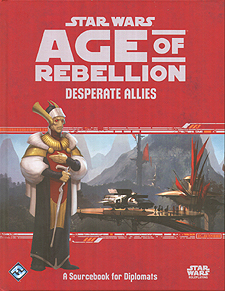 This rulebook expands upon the Age of Rebellion Roleplaying Game, presenting new options for Diplomat characters as well as any other characters interested in pursuing intrigue in the Star Wars galaxy. Persuade allies to the cause, weaken the Empire's grip on the galaxy, and pave the way to a new age of freedom! Expanded character options including Motivations, Duties, species, and specializations. New, powerful signature abilities that allow Diplomat characters to become masters of their careers. Tools, vehicles, and droids suited to the intrigue and challenges of navigating the treacherous political landscape of the galaxy. Rules for constructing, upgrading, and operating Rebel Bases.